In this video, Dr. Robert Morrison answers frequently asked questions about Chiropractic. Which techniques does Dr. Morrison use? What type of education is required to become a Doctor of Chiropractic? What is the program of study at chiropractic universties? What is a typical visit to Dr. Morrison like? Will I be asked to remove my clothes? Is therapy performed on the first visit? What is the Chiropractic adjustment exactly? How do I maintain the benefits of therapy? Chiropractic is a science based on the theory that disease and ill health are caused by irritation of the nervous system by mechanical, chemical, or psychic factors. As such, Chiropractic seeks to restore and maintain health by identifying noxious irritants to the nervous system and removing them with conservative, all-natural therapies. Yes. Chiropractors evaluate the whole person, not just their local area of symptoms (see Holistic Medicine). Patient care is based on addressing the underlying causes of pain and dysfunction, rather than suppressing symptoms with medication. The word Chiropractic comes from the Greek “kheir” (hand) and “praktikos” (to do). Doctors of Chiropractic specialize in the diagnosis of neuro-musculo-skeletal disorders, and treatment is done by hand. There are dozens of Chiropractic techniques, so a visit to one Chiropractor may be quite different from that of another. However, the one thing that all Doctors of Chiropractic have in common is that they use a non-pharmacological, non-surgical approach, and specialize in using their hands to treat. Dr. Morrison uses various techniques and applies them according to the needs of the individual. As a Chiropractor, board certified Diplomate in Applied Kinesiology (D.I.B.A.K.) and board certified Diplomate in Clinical Nutrition, Dr. Morrison's concentration is on combining Applied Kinesiology with standard Chiropractic, while emphasizing diet and nutrition. Standards vary from state to state and from country to country, but in the U.S., the degree of Doctor of Chiropractic (D.C.) is a 4-year program of approximately 5000 academic hours. Depending on the state, prerequisites are 2 to 4 years of undergraduate studies that comprise the pre-med program. For a license to practice, chiropractors must pass both a state and national board exam. Apart from seeking relief from pain or looking to resolve long standing problems, people seek regular chiropractic care to maintain good health. As the saying goes "It's easier to stay well then to get well." Many pathologies and injuries can in fact be prevented if confronted early on. Prevention is one of the main reasons people do maintenance care chiropractic. 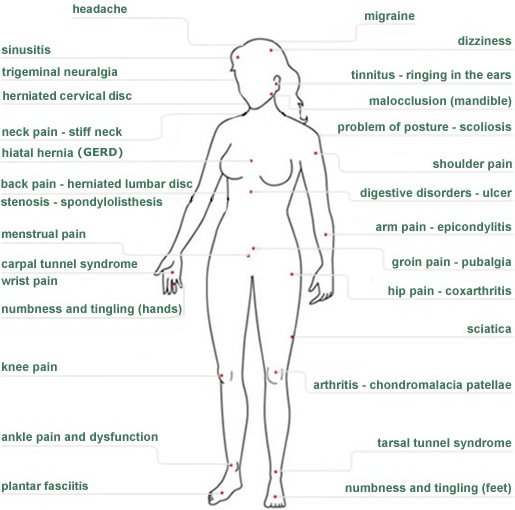 We invite you to click on Conditions Treated to view some of the more common problems seen by chiropractors. On the first visit, Dr. Morrison investigates your current health concerns and your past health history. This information guides the physical exam: postural analysis, motion tests, standard orthopedic tests and a neurological evaluation. Gentle muscle testing is central to the applied kinesiology and is therefore used by Dr. Morrison throughout the examination. It is usually not necessary to remove one's clothes entirely though sometimes certain areas must be exposed in order for it to be treated adequately. In these cases gowns will be provided or you will be asked to bring the appropriate garb. NB. The videos on this website were filmed in Europe where therapy is customarily performed in undergarments. Unless there are contraindications, therapy is nearly always performed on the first visit. This may consist of vertebral and extremity adjusting, cranial techniques, Chinese meridian therapy, myofascial techniques, various neuro-reflex procedures, or deep muscle and tendon massage. We invite you to click on Services for a detailed description. Vertebrae and other bones that are not in alignment are called subluxations. Two or more vertebrae that are contiguously locked in place are called fixations. X-rays, MRIs or CT scans are not required to schedule a first visit, and usually aren't requested by Dr. Morrison. However if you already have them, it is advisable to bring them to your first visit and we will review them accordingly. Virtually everybody can benefit from Chiropractic care because there are so many ways in which it can be applied. Occasionally surgery or pharmacological intervention are a viable option, but much of the time this could and should be avoided. Chiropractic is a conservative approach but it is powerful. One of the main differences between Chiropractic and mainstream medicine is that Chiropractors treat people, not diseases. Sometimes the goal of therapy is to provide pain relief for people who want to avoid drugs or surgery. Other times there may be no pain at all, but rather the goal is to improve or maintain health. An example of this is a patient with a serious condition such as multiple sclerosis who is not in search for an everlasting cure, but are very grateful for the symptomatic relief provided by Chiropractic. Dr. Morrison aims at arriving at the roots of a problem in order to keep it from recurring. Many problems are resolved permanently, while others may depend upon on how well they maintain their own health. Dr. Morrison assists in this effort by providing counsel on ergonomics, exercise, and diet. When applicable, maintenance care programs may also be prescribed.